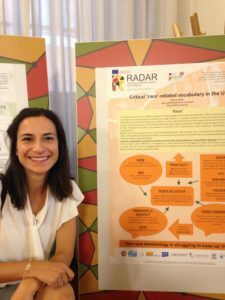 The RADAR national workshops took place between April and June 2016. As part of Workstream 3, six national workshops were organised in the partner countries (Italy, Finland, The Netherlands, Poland, Greece and the UK) to test the training approach and material developed. 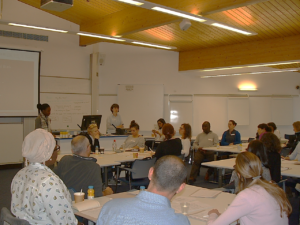 The UK workshop “From hate speech to hate communication: How racism is produced and reflected through communicative practices” took place on 16-17 June 2016 (16 hours in total) at the Esmée Fairbairn building in Heriot-Watt. The workshop, led by Dr Katerina Strani, with Rania Qussasi, Eloisa Monteoliva and Emma Hill, was intensive but very successful. Among the 28 participants were social workers, equality and diversity experts, police officers, project workers, volunteers, students and teachers. The first day included a short presentation of the project’s aims, followed by a session on terminology – unpacking salient terms. The discussion focused on the challenges of creating a vocabulary of ‘race’-related terms, as well as the concepts of whiteness, white privilege, racialisation and colourism. 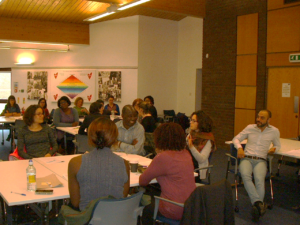 After lunch, we presented the findings of our interviews in terms of experiences of racism and hate crime. This was followed by a session on laws and judgments in the UK (mainly Scotland and England) related to racism, racial discrimination, hate crime etc. The second day was more hands-on and it consisted entirely of group work. The question of representation was probed during an analysis of written texts and newspaper articles, social media posts, advertising images and videos. The end of the workshop was marked with a round-table discussion on challenges with regard to the rise of hate communication and how to use what we have learned in the workshop in the workplace and everyday life. 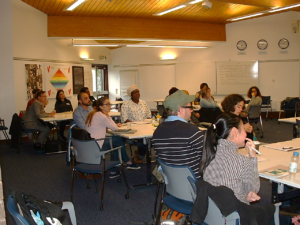 The workshop received very positive feedback and this was also a great networking opportunity for people working with migration, community relations, minority ethnic groups, xenophobia, racism or intercultural communication in general. 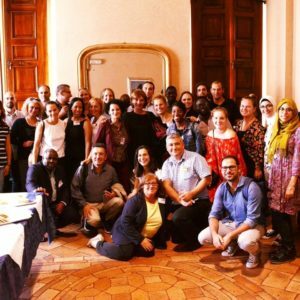 Next, the RADAR international workshop and final conference took place on 12-14 September in Perugia. Drawing on the knowledge and expertise gained from the local pilot events, the international workshop brought together all RADAR partners and their external experts for the purposes of drafting the general RADAR recommendations and guidelines as the final deliverable of the project. The UK team was represented by Katerina Strani with Rania Qussasi as the external expert. The final conference took place in Palazzo Donini, Regione Umbria, and was very well attended by academics and community representatives. It presented the RADAR project results and the draft guidelines, which were discussed at a round table. Katerina Strani with Maria Fountana and Stavroula Sokoli presented a paper on “Attitudes to ‘race’ in the media: Evidence from the UK and Greece”. Katerina also presented 2 posters at the conference: i) with Emma Hill on “Critical ‘race’-related vocabulary in the UK” and ii) with Emma Hill on “AntiRacism and AntiDiscrimination Laws and Judgments in RADAR partner countries”. The 24-month project ends in November 2016. You can have a look at the project’s outputs so far if you register on the RADAR platform.